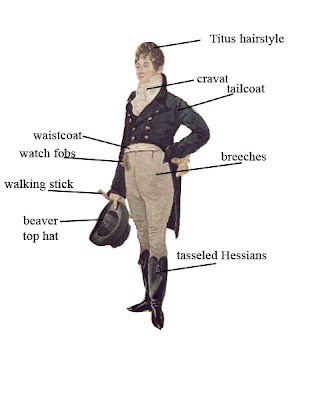 Beau Brummell, né George Bryan Brummell (7 June 1778, London, U.K. – 30 March 1840 (aged 61), Caen, France), was the arbiter of men's fashion in Regency England and a friend of the Prince Regent. He established the mode of men wearing understated, but fitted, beautifully cut clothes, adorned with an elaborately-knotted cravat. Beau Brummell is credited with introducing and establishing as fashion the modern man's suit, worn with a tie. He claimed five hours to dress, and recommended that boots be polished with champagne. To wit, his style of dress was known as dandyism. In 1794, Brummell was an undergraduate at Oriel College, and later embarked upon a military career, but resigned his commission and abandoned it when his cavalry regiment was ordered quartered to Manchester.